One Piece has waded into some dark territory over the years, but the series shared its dark moment yet . Not long ago, the new chapter of One Piece went out to the world, and one of its aside panels shows a truly horrifying moment. One Piece, they will know how chapter 918 kicks off. It follows Monkey D. Luffy and Roronoa Zoro as they flee Bakura Village with O-Tama in tow. After taking down Holdem, Luffy escapes the sanctioned city..
As the chapter comes to an end, Luffy as he does something Shanks would be proud of. The Straw Hat captain brings all of the food taken from Bakura’s nobles down to the poor in the outlying areas.. There is a dark panel tucked into the bottom-corner of the spread. Fans can see an older woman kneeling down in a patchwork kimono crying. A knife can be seen held in one of her hands while her wailing child sits in her other. The woman is poised to kill her baby as a mercy, preventing them from living a harsh life that would end far too early. There is also an older man shown praying before a noose as he was preparing to kill himself before Luffy arrived to their town with newfound hope. there is also a dark detail to be found in the spread’s main image. If you look at the bottom of the panel showing Luffy’s arrival, a skull can be seen cracked on the dry ground. 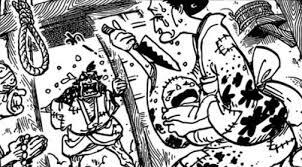 The ominous image is a reminder that death favors no one in Wano, and it seems Luffy will be the one to swat the Grim Reaper away from its would-be victims now as he’s taken them under his care.